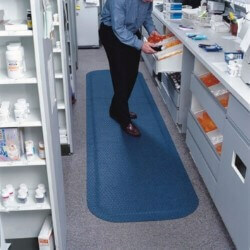 Hog Heaven Plush mat offers Hog Heaven cushion with an appealing solution dyed nylon carpet top surface. 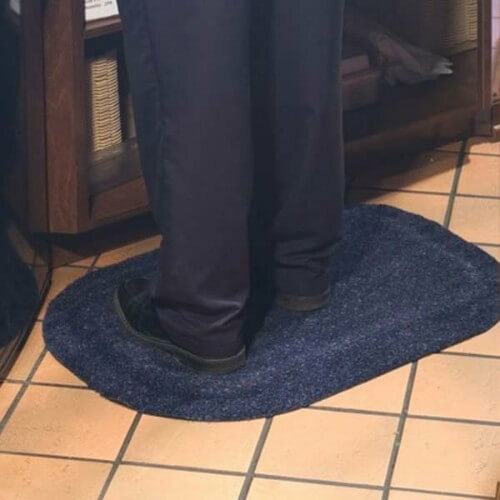 Available in five colors, the anti-static nylon top surface makes Hog Heaven Plush ideal for use around sensitive electronic machines. Available in two thicknesses: 5/8" and 7/8". 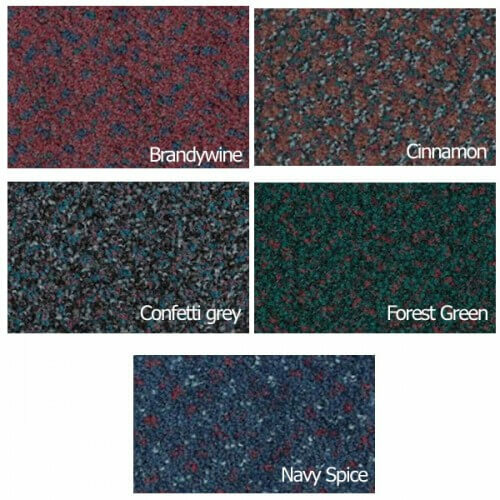 Colors available: Navy Spice, Cinnamon, Confetti Grey, Forest Green and Brandy Wine. Production time: 3 to 5 business days. 1. Carpet top is an attractive addition to any décor. 3. 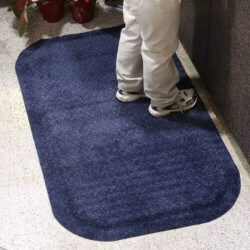 Slip resistant top surface will not fade. Can be bleached to clean up color from time to time. 4. Designed for maximum worker comfort and striking appearance. 5. 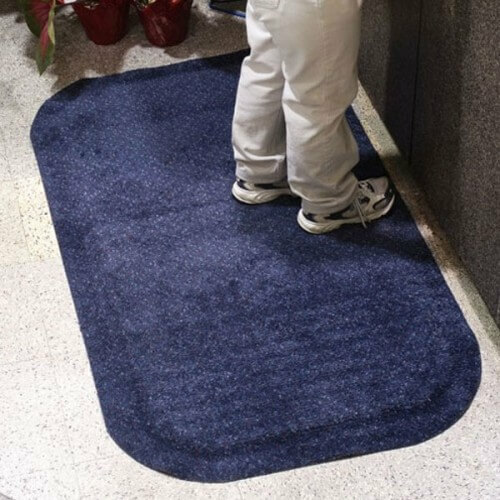 Tightly twisted nylon yarn: resists pilling and crushing, allows dirt and moisture to filter down into mat so it cannot be tracked in. 6. 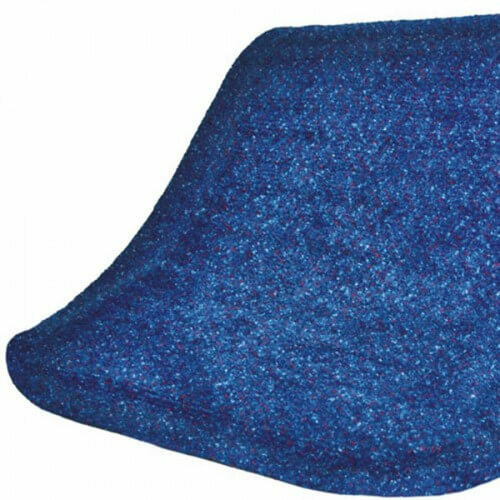 Cushion is permanently bonded to the Nitrile Rubber top and will not delaminate like mats with glued on cushion. 8. 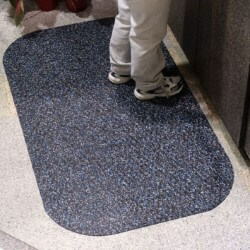 Beveled edges and curved corners create a safer transition from mat to floor. 9. Hog Heaven Plush is available in 2 thicknesses, 5/8" and 7/8". 11. 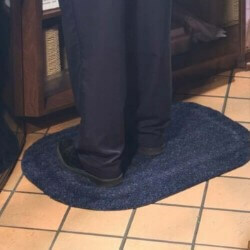 Recommended for use at cashier stations, bank teller areas, hotel check-ins, and sensitive business machines. Surface Fiber Type: Solution dyed BCF 2 ply continuous filament nylon, type 6.0, 5½ x 5½ twist output, heat set. Durometer: 65 TENSILE: 1100 PSI TESTING Passes Flammability Standard DOC-FF-1-70 Electrical Resistance _IBM (Surface to Ground) NFPA 99 Chapter 12 Section 4.1.3.8 (6) (7), 1990 Average Electrical Resistance 2.94 x 1010 ohms.